In a previous post on March 1, 2012 I had speculated about a likely connection between Lyon & Healy of Chicago, and Oliver Ditson of Boston. A drum recently auctioned on ebay would seem to disband any doubt that there was in fact some sort of business arrangement between the two companies at one point in time. Ebay seller "youcollectstuff" of Healdsburg, California listed for sale a rope drum in less than oustanding condition which had clearly been subjected to an unfortunate aftermarket paint job somewhere along the way. 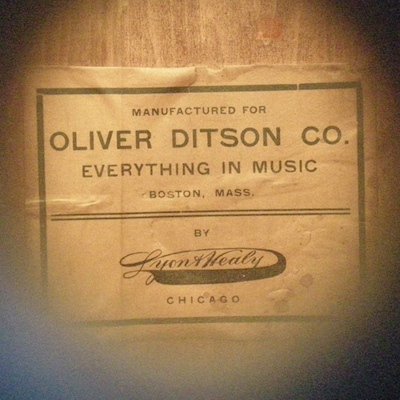 But what is fascinating about the drum is the paper label inside which reads "Manufactured For / Oliver Ditson Co. / Everything in Music / Boston, Mass. / by / Lyon & Healy / Chicago". That pretty much says it all. With this information learned, it leads to many other unknowns. For one, we don't know when exactly this collaboration began and ended. And was Lyon & Healy the only one building drums for Ditson at this point in time? Who else may have been producing drums for Ditson and when? And how late, and to what extent, was Ditson still manufacturing drums for themselves during the early 20th century? All of these questions linger, but we can now say definitively that Lyon & Healy was at one time supplying drums to Oliver Ditson. 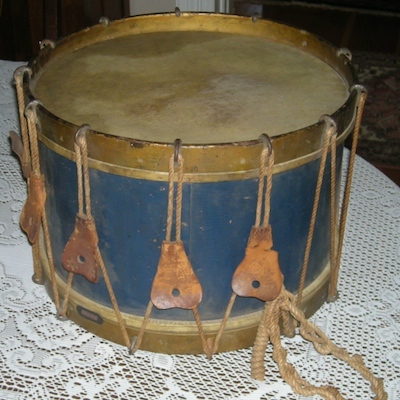 Do you have a drum made by Boston's Oliver Ditson Company? I want to hear from you! Send Lee an email at lee@vinson.net.